As we prepare to mark the 100th anniversary of the end of the First World War, much of our focus will be on the tragedy of the millions of men on all sides who were killed or came home dreadfully injured. It was the greatest slaughter of fighting men in living history. But what of the women they left behind? 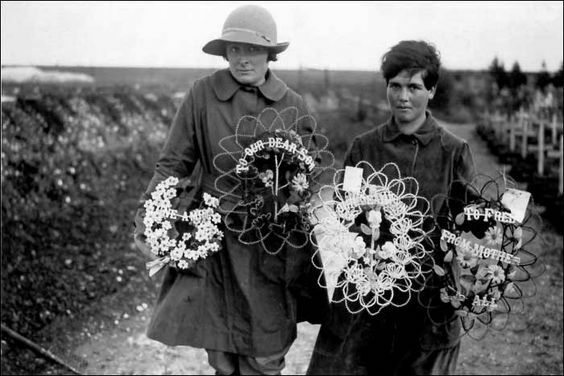 Many historians argue that the First World War was a watershed for women. Anyone who watched Downton Abbey will be familiar with the usual version: as men went to war millions of women previously in domestic service or working at home stepped into traditional male roles in factories (particularly munitions and arms manufacture) and many other sectors including farm work, bus and tram drivers and ‘clippies’, and the postal service. More than ten thousand joined the newly-created branches of army, navy and air force and many more travelled behind the lines to volunteer as nurses and ambulance drivers. workers and police patrols. These women enjoyed these new freedoms: the satisfaction of work, of better wages and wearing more practical fashions of trousers, shorter skirts and looser waistlines. Shortly after the war, women got the vote for the first time. The suffragette Millicent Fawcett said, ‘The war revolutionised the industrial position of women – it found them serfs and left them free.’ In other words, it brought a new emancipation for women, changing their lives for ever. But the truth was not so rosy. Yes, women did get the vote, but only if they were over thirty and held property, while men could vote at 21. It’s hardly surprising that just one woman MP was elected in the General Election of December 1918. Women were not equally enfranchised until ten years later. But perhaps the greatest change of all was the terrible loss endured by those left behind. More than three quarters of a million British men died – nearly one in ten of all men under the age of 45. In the whole of Britain just a few dozen parishes, later dubbed ‘thankful villages’, remained unaffected. Even for those whose husbands, sons or brothers returned alive the nightmare continued: many had sustained disastrous physical injuries or terrifying, little-understood mental trauma that would afflict them for the rest of their lives. They called it ‘the lost generation’. Many were literally ‘lost’ – the bodies of one in four of all those who died in Flanders were never actually found, making the bereavement all the harder to bear. My husband’s uncle, whose name is inscribed on the Menin Gate, was one of these. He had just become engaged to his childhood sweetheart. It was this that compelled me to write In Love and War, about the women who braved the difficult journey to those devastated war zones in a desperate search to find any trace of the men they loved. And to try, as my character Ruby says, ‘to make sense of it all’.